Mom's Gone Bronson! : Daddy & Co. Scrubba Dub Dub with Daddy Duck - Soft Book Giveaway! 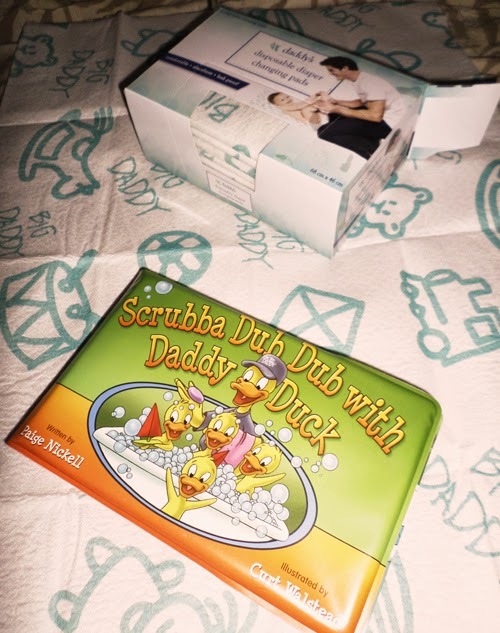 Daddy & Co. Scrubba Dub Dub with Daddy Duck - Soft Book Giveaway! Here is something else from Daddy and Co. this week - this sweet little soft book called "Scrubba Dub Dub with Daddy Duck!" This is a cute little book that would make a great starter for your son/daughter and their daddy (or mommy) to share with them and would make a cute addition to a baby shower gift bag or on its own - it is never too early to introduce books to your children and reading can bring so much joy to the parent AND the child! I love this quick read that entertains baby and older children, too! My toddler and baby sat and listened to me read this book and the toddler cheered at the end! The baby wanted to eat it and that was O.K. too because it is soft and safe enough for a younger child to handle! This book can be found at the Daddy and Co. website for $10.99 HERE, BUT, you can enter below to win one of your very own, gratis! All you have to do is enter as many of the entry criterion you like and sit back and wait for us to pick a winner! ONE winner will be picked at random and emailed within 24 hours of giveaway end and will have 48 hours to respond to the winning email. Please enter with a valid email and check your emails promptly. If we do not get a response within 48 hours then a new winner will be chosen and your original win shall be forfeit. Daddy & Co. is responsible for prize fulfillment for this book, not Mom's Gone Bronson. If you want to find out more about this item or similar, then just head on over to the website, Twitter or Facebook and get in touch with Daddy & Co or to pick up something for that new parent in your life! Enter below now before 04/24/14 for a chance to win! Disclaimer: I was provided with a book in order to do this review. All opinions are my own and your opinions may differ! Thank you! I always loved the book Brown Bear Brown Bear. Even my kids love it!